I’m personally obsessed with the stuff! It is so incredibly yummy, super easy to drink and really helps me stay hydrated, even while getting a rigorous workout in! I feel like my focus is better and I swear I’ve noticed a mood boost since drinking it too! I love the taste of coconut water but usually shy away from the stuff because it tends to be so high in sugar. 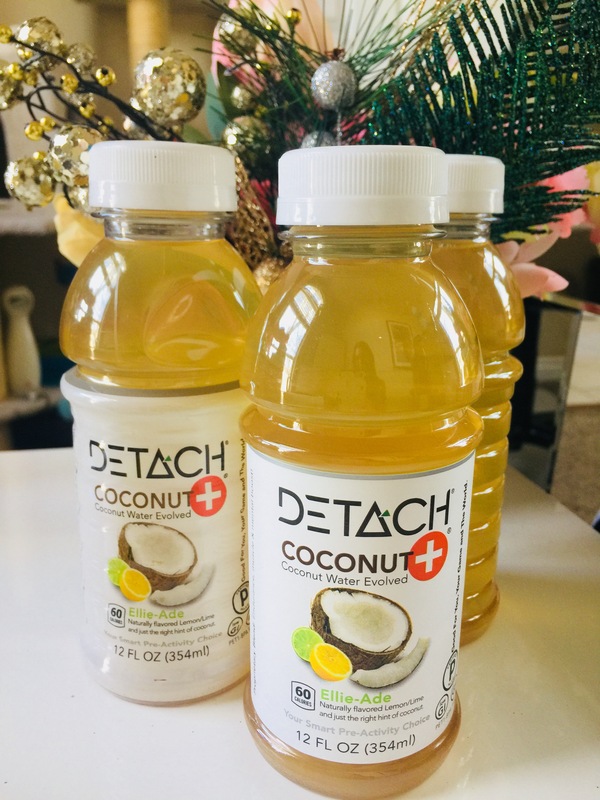 I absolutely love that Detach Coconut water is relatively low in sugar and not overpowering-ly sweet like so many other coconut waters out there! The taste is total perfection! And I absolutely love that I get so many other wonderful health and mental benefits from drinking it – as well as some added beauty benefits too! It’s not just a hydrating drink, it’s a superfood powerhouse perfect for anyone who works out regularly or just wants to feel good and function at their best! Hi Linda! Sign-up to our community at http://join-our-community.drink-detach.com and save some $$$ on your first case of Detach! I love that it’s delicious and SO good for you!! I already really love coconut water for its hydration but I love that this one has a low glycemic index as well!! Hi Amber! Sign-up to our community at http://join-our-community.drink-detach.com and save some $$$ on your first case of Detach! Hi Amy! Sign-up to our community at http://join-our-community.drink-detach.com and save some $$$ on your first case of Detach! I did not realize that coconut is the new superfood! I can’t keep up! I heard Kale was too. One food that has usually helped me is garlic! My doctor tells me to eat a banana a day for potassium. Coconut water would also help my immune system. Well it sounds like a win – win to me! Thank you for sharing!! we just tried this and it’s amazing and makes us feel GREAT! I’ve heard lots of great things about coconut water but didn’t know details on this specific brand! I can’t wait to try it now! Thanks for the info!